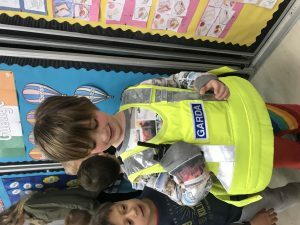 The Aistear theme this month was ‘People who help us’. 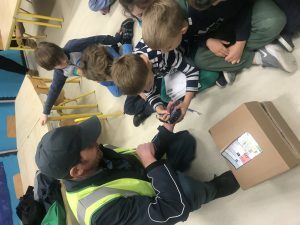 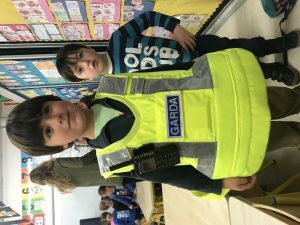 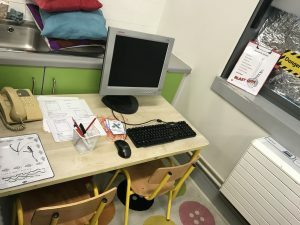 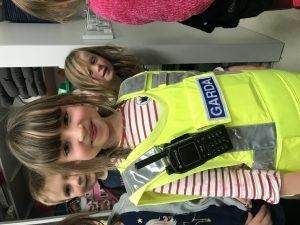 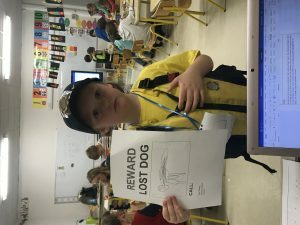 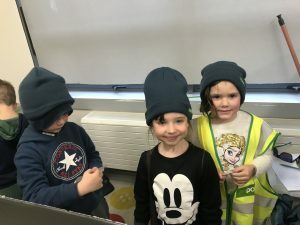 The children operated a Garda station and a post office over the month. 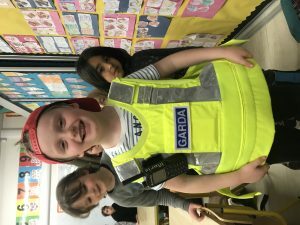 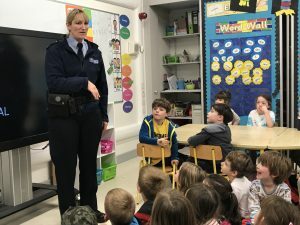 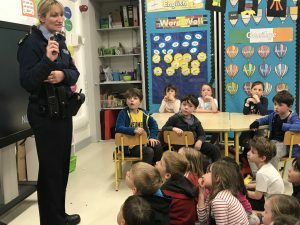 The local community Garda came in and discussed the role of the Garda and the children learned all about the different equipment they use. 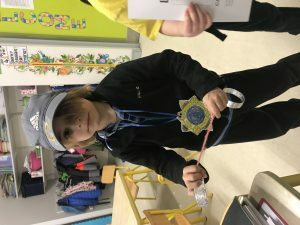 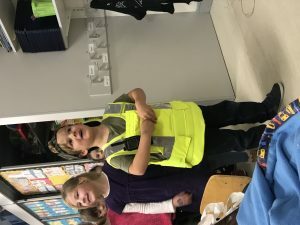 The class got to try on some of the protection gear and to use the baton aswell! 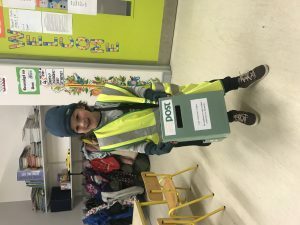 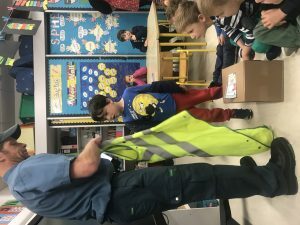 We were very lucky to have a postman come in and speak to the class all about hoe the post gets to our door and how many parcels ‘An Post’ delivers at this busy time of the year! 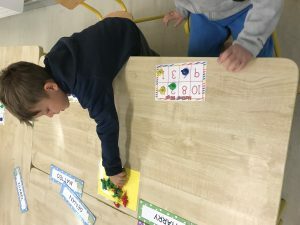 The children continued their work in Literacy moving on to blending stations using games. 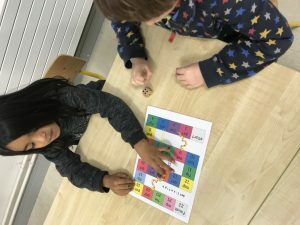 The games included snakes & ladders, roll and read, reading race games. 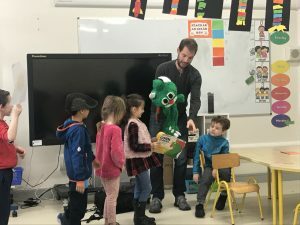 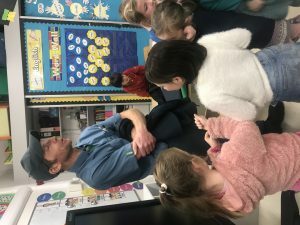 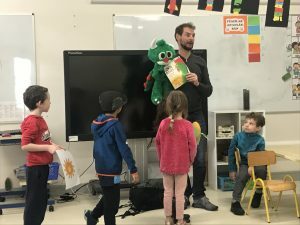 We had a visitor in from SEAI to talk to the children about saving energy and they met ‘Guzzler’ who helped them learn all about how we guzzle energy everyday in school! 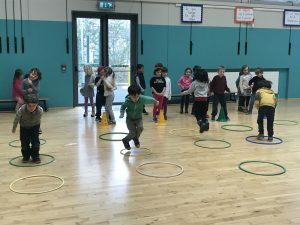 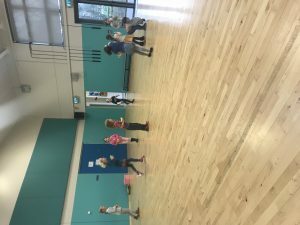 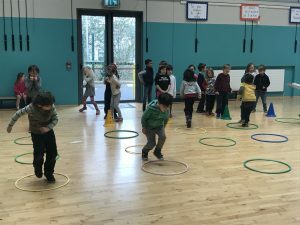 The children continued working on jumping, hopping, and team work in PE with lots of crossover in the classroom with movement breaks and exercises in between subjects! 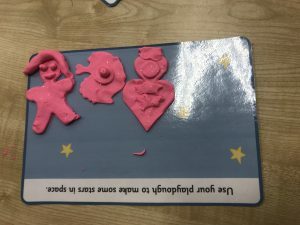 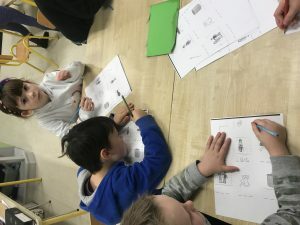 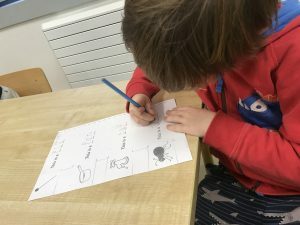 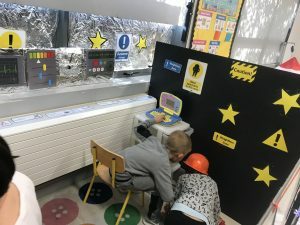 This month we covered Space during Aistear! 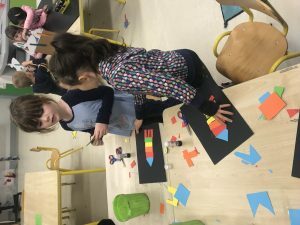 The children worked in the Space Station and fixed the space rocket. 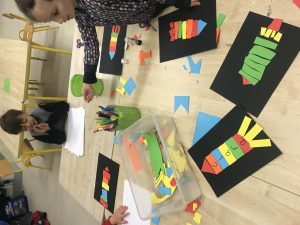 The children made shape space rockets displaying their names, they had to draw and cut out and glue the rocket together. 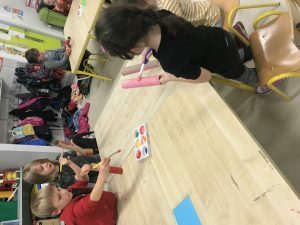 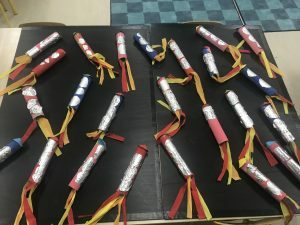 They produced colourful rockets! 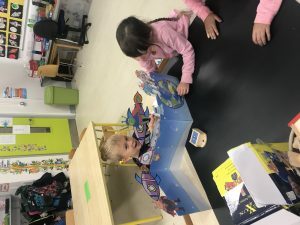 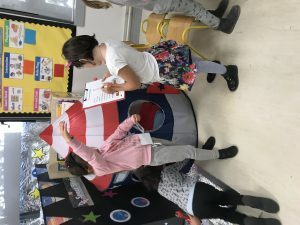 In the small world station the children pretended they landed on the moon and used the space stick puppets and display and spoke to the whole class about their adventures there. 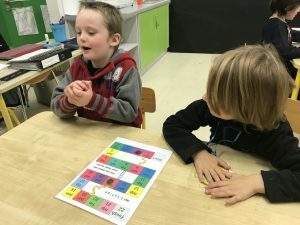 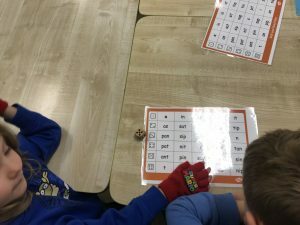 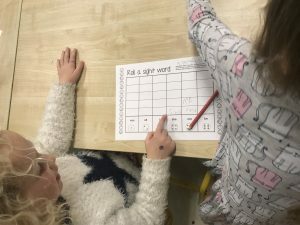 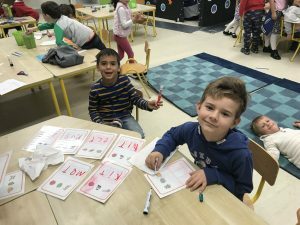 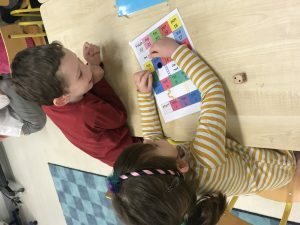 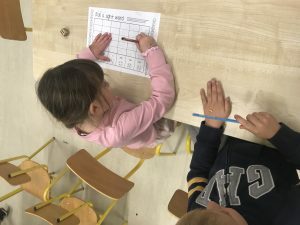 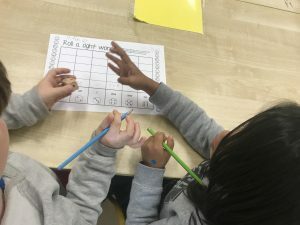 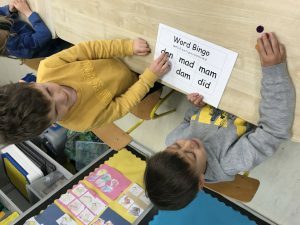 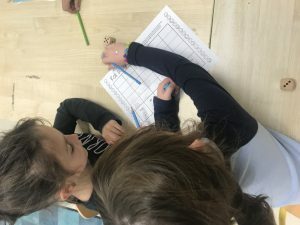 The children practiced their sight words playing a dice game in partners, rolling the dice saying the word and writing it and racing to the top to win! 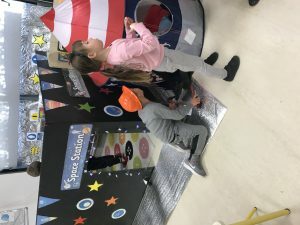 During the construction station the children made space helmets and built a space rocket which they climbed into! 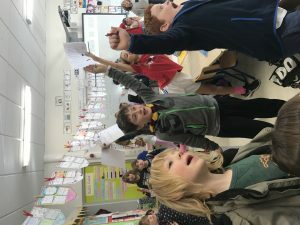 The children used all their kitchen rolls they have collected to make their own space rockets and put them together with the help of some 6th class children! 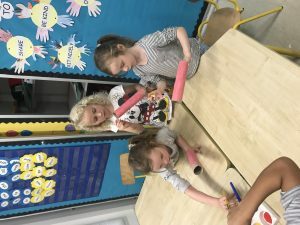 They had great fun pretending to launch them altogether. 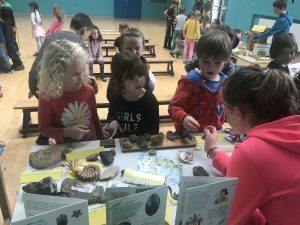 The school is beginning their work on their green flag, they attended a bio diversity display in the hall. 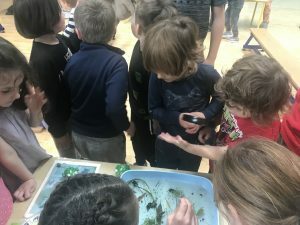 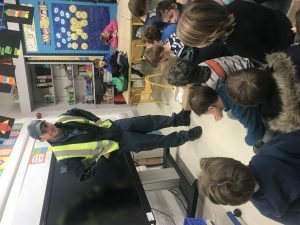 They learned all about the schools grounds and the wildlife living around it. 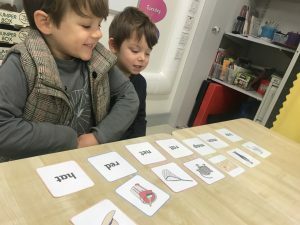 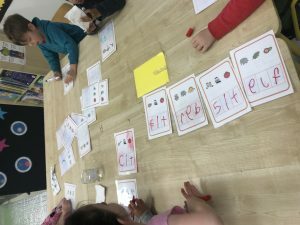 More work at the literacy station as the children use their sounds to create words to read. 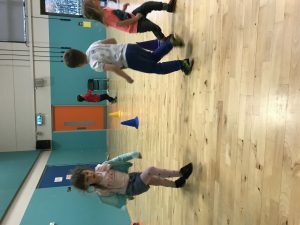 All worked very hard and had great fun trying to get them all completed as a group! 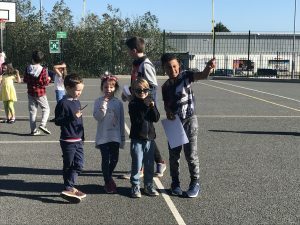 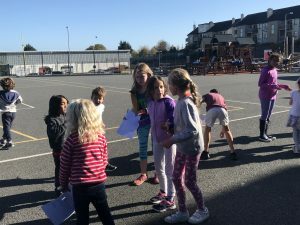 The school participated in Maths week during October and went on a maths trail with 4th class around the school. 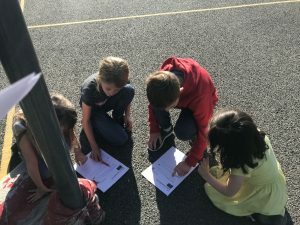 They loved being upsatirs where all the big children are and had great fun finding the answers to all the maths questions! 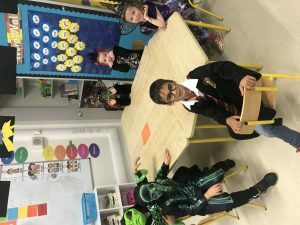 For the last week of term the children visited the witches den in the role play area and dressed up and wrote up some potions! 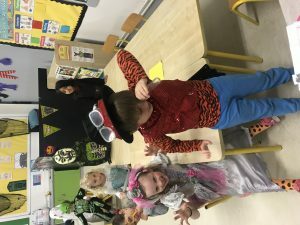 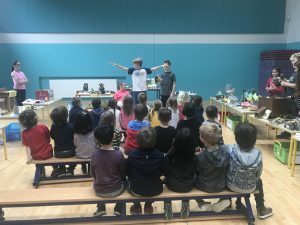 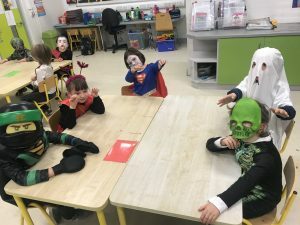 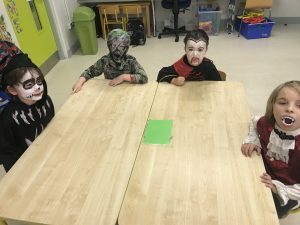 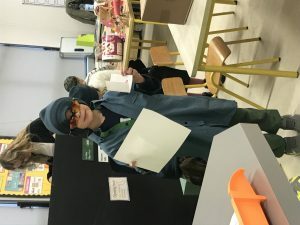 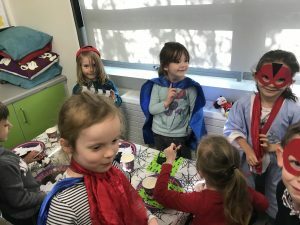 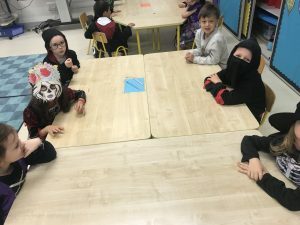 The class loved coming in all dressed up in their costumes and had great fun taking part in a show and tell time about what they had come to school as! 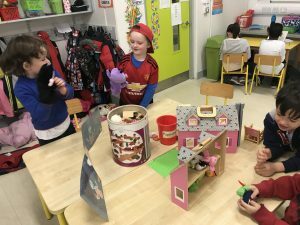 We started off the school year with getting to know our routines and adjusting to being Senior Infants! 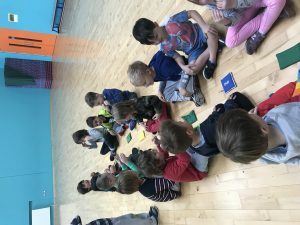 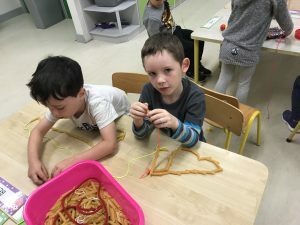 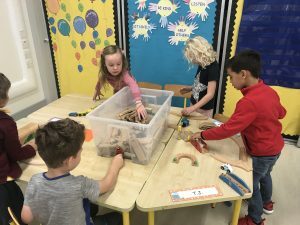 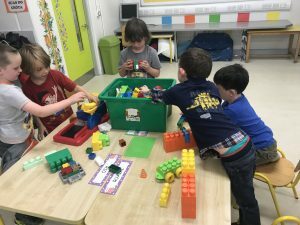 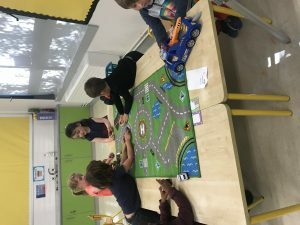 All of the children have settled in really well and enjoyed starting each day with morning activities to help both with gross and fine motor skills. 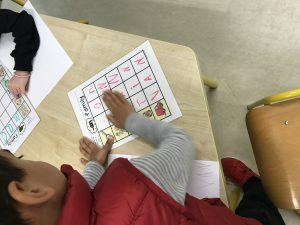 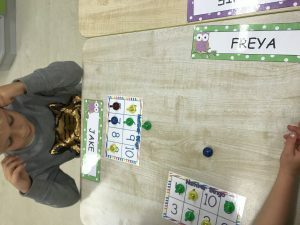 In math’s we revised the numbers 0-10 with different activities including number bingo! 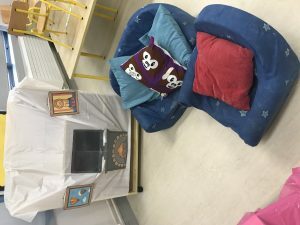 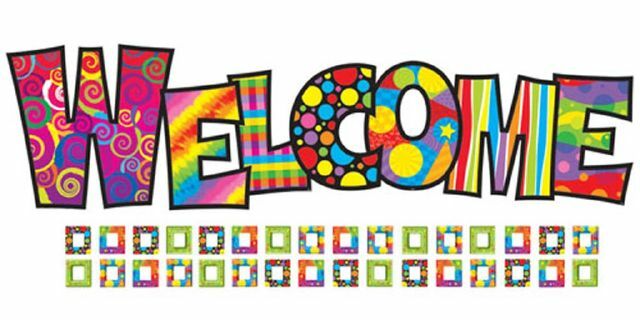 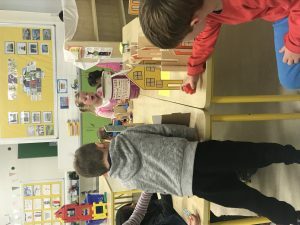 We began our first Aistear theme of the year ‘House and Homes’. 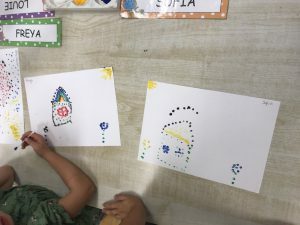 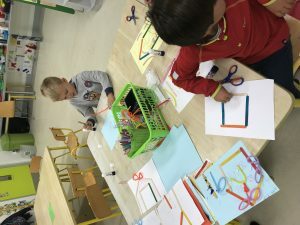 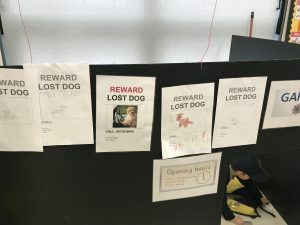 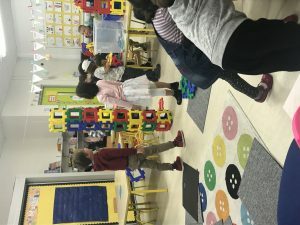 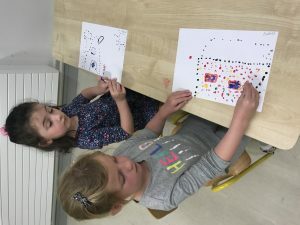 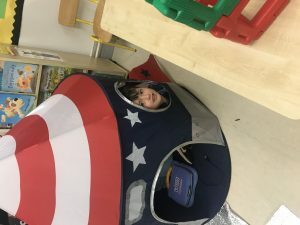 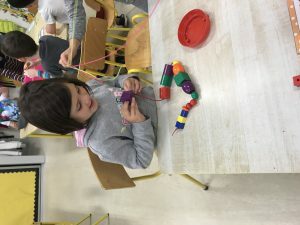 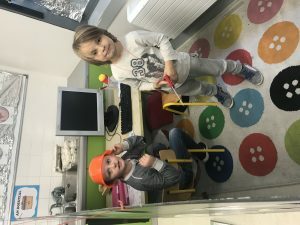 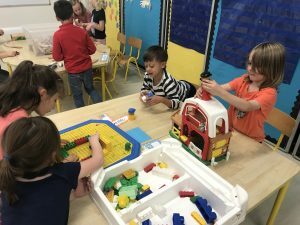 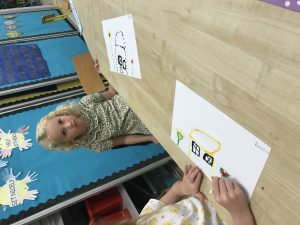 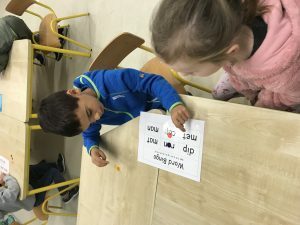 The children engaged in different activities including dot painting their own homes, and playing in the role play area. 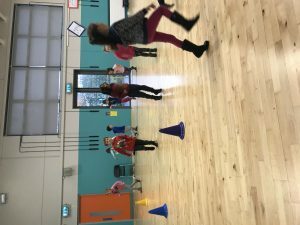 In PE this month we are covering the games strand which helps with listening and co operation skills also. 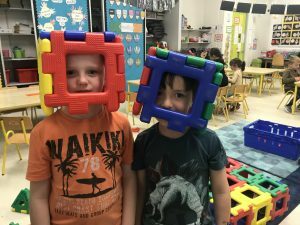 The children played, ‘head, shoulders, cone! 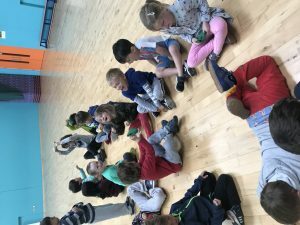 game which was great fun! 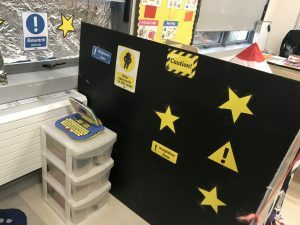 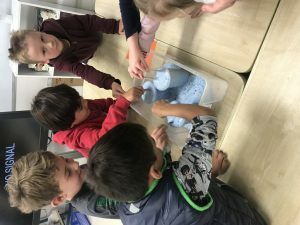 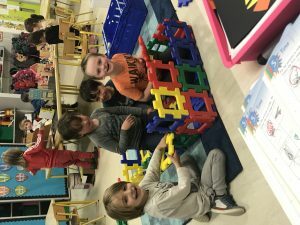 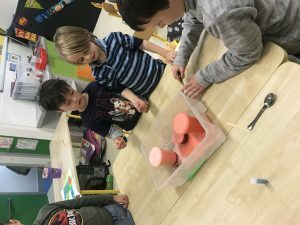 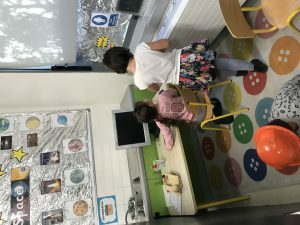 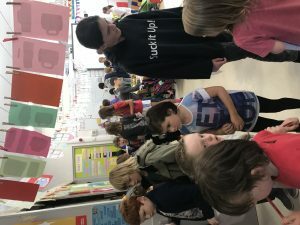 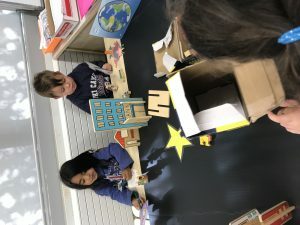 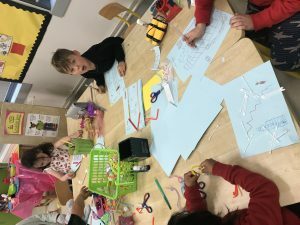 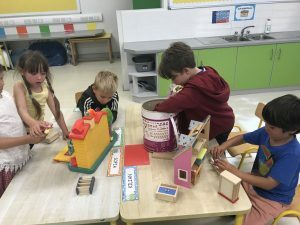 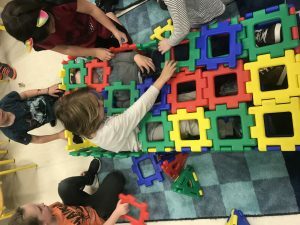 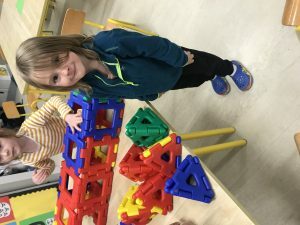 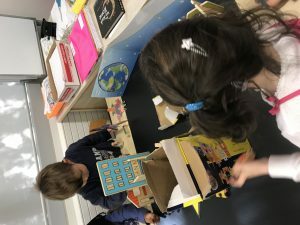 One of the most engaging stations in Aistear was the construction station when the children used the Polydrons to build different types of houses including Skyscrapers! 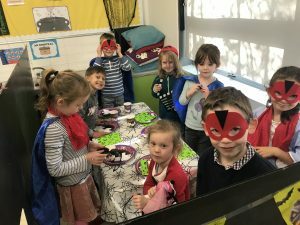 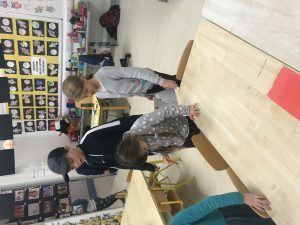 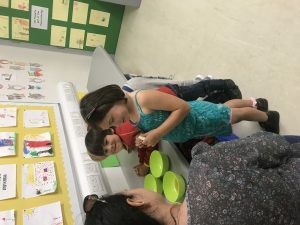 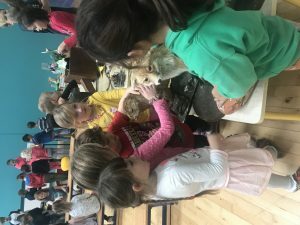 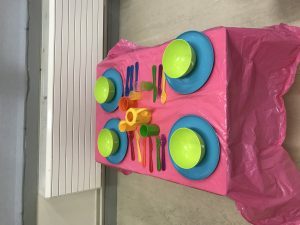 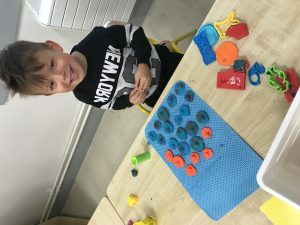 The Arts and Crafts stations also allowed the children to construct lollipop stick houses and in the play dough station alot of the children made food for the kitchen in the homes. 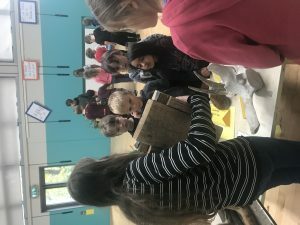 In Learn Together we looked at the celebration of Rosh Hashannah and the children got to taste one of their traditions at this time of year by dipping apples in honey! 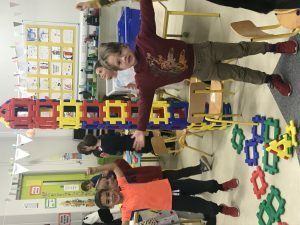 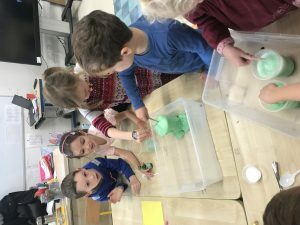 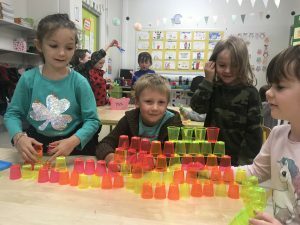 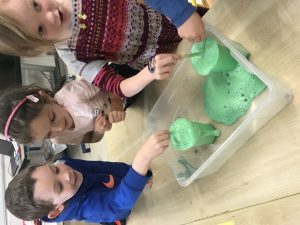 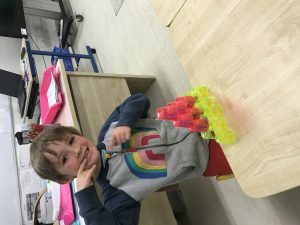 During the last two weeks we concentrated more in our morning activities on fine motor skills including an activity involving making a tower with small glass which the children really enjoyed. 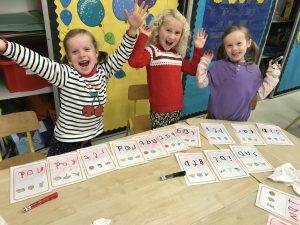 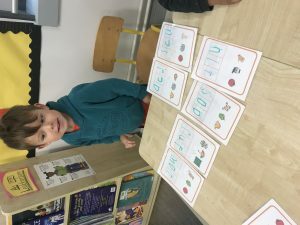 In English this month we are revising our Jolly phonics along with some rhyming CVC words. 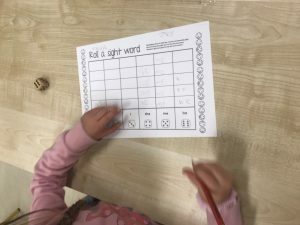 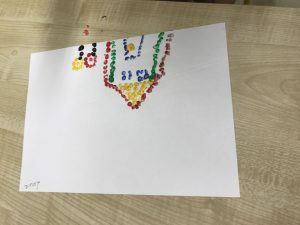 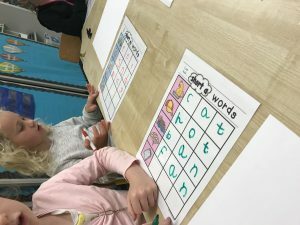 The children enjoyed the activities around this and extended it further by writing the words out again when they had completed a card before they rubbed them out! 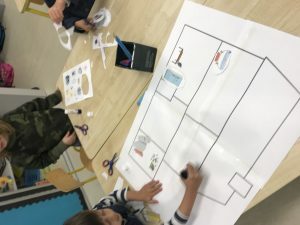 The last homes art activity was a group activity to cut and stick the different things we find in a home and discuss as a group where they go and why. 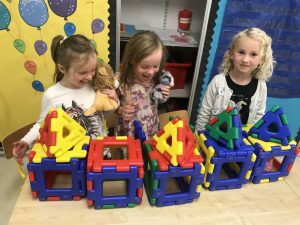 The children worked well together and produced some lovely homes! 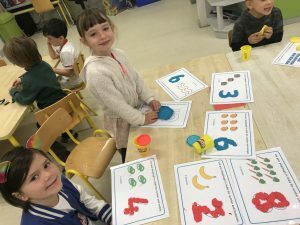 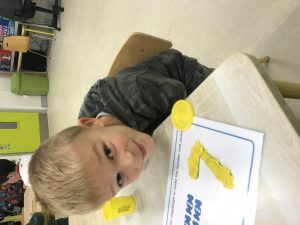 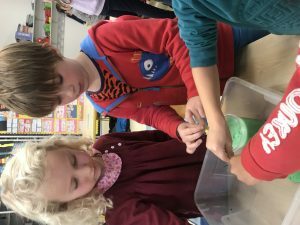 The children practised with playdough making the numbers 1-10 along with making the quantity needed also. 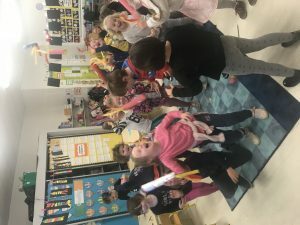 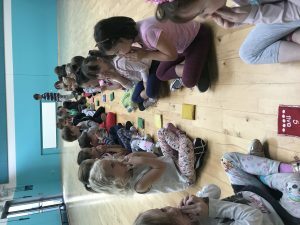 The class began their Music session again this year with teacher Tracy and have remembered loads of the songs and actions from last year in junior infants!